Yes! See branding case story. When a recent hire declared, “If I were choosing a firm solely based on its website, I would never work here,” it was clearly time for a new site. 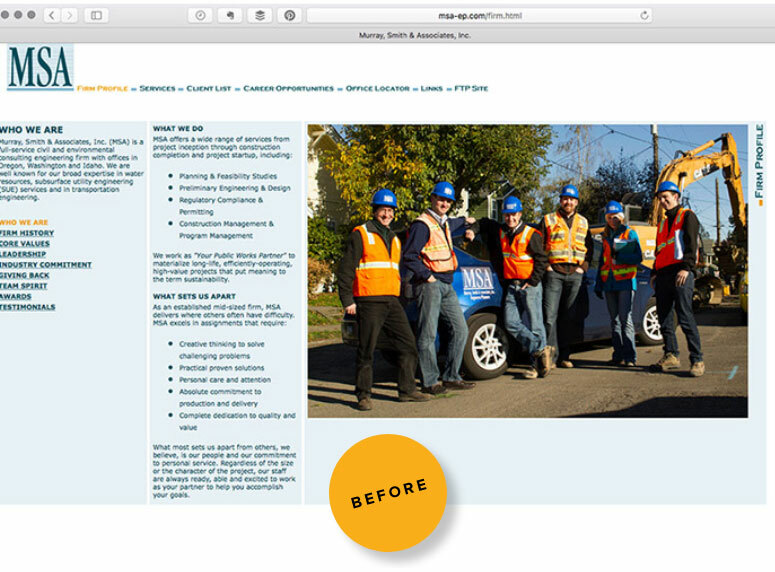 The existing site didn’t effectively convey the firm’s culture. Though there were lots of facts, it lacked emotional appeal. Small, dated images and an awkward navigation system contributed to a poor user experience. And the site wasn’t optimized for mobile and tablet users. 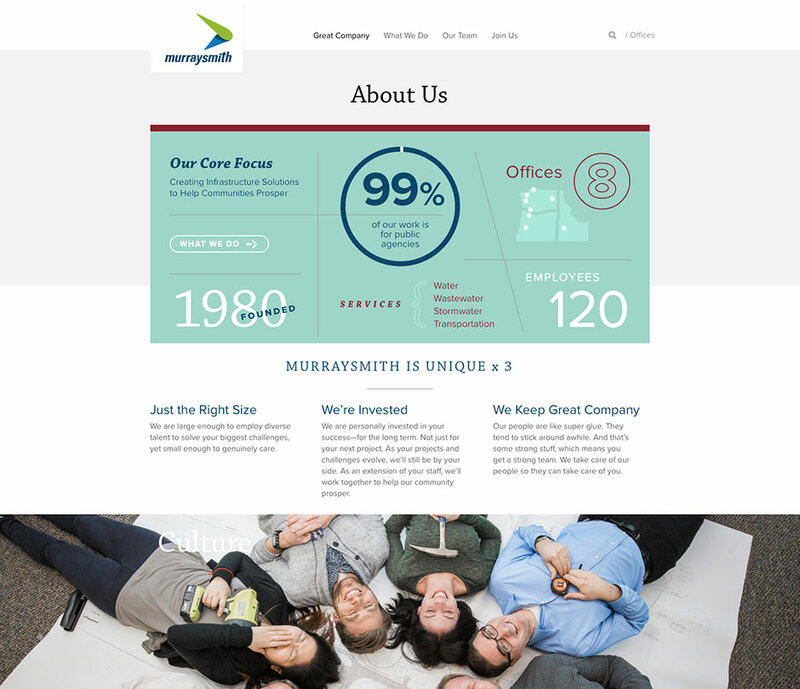 Primary Goal: the new site is to attract talent by showing what it’s like to work at Murraysmith. Since the site was hard-coded without the use of a content management system (CMS), nobody within the firm could make updates. As a result, fresh content that users value and Google rewards in search rankings was not being added. Goal: Instead of updating the site every twenty years, allow staff to update the site daily. Build a custom site, then train staff on a fun-to-use content management system. 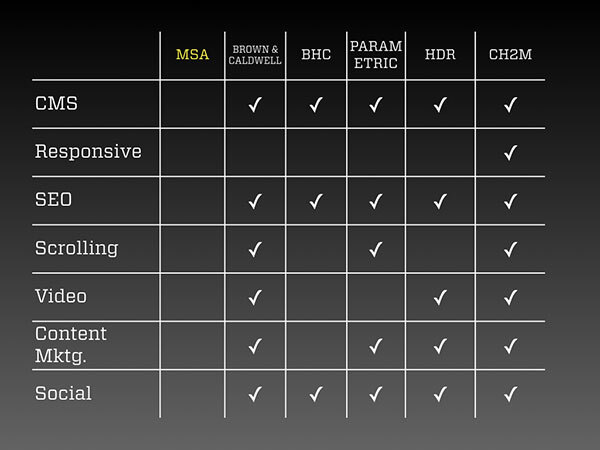 The project began with a Discovery Phase that included an audit of the current 20-year-old site as well as several competitor websites to assess how MSA compares in the digital landscape. This competitive audit revealed how much the site lacked in terms of modern website attributes. Because a great website is rooted in brand strategy, we summarized the website strategy in a five-page strategic brief outlining the why, what, who (both users and internal resources), when and how of the new site. From the strategic brief, we develop the positioning statement shown on the left. It defines the firm type (engineering), who it serves (communities) and how it is unique (public infrastructure and we live where we work). 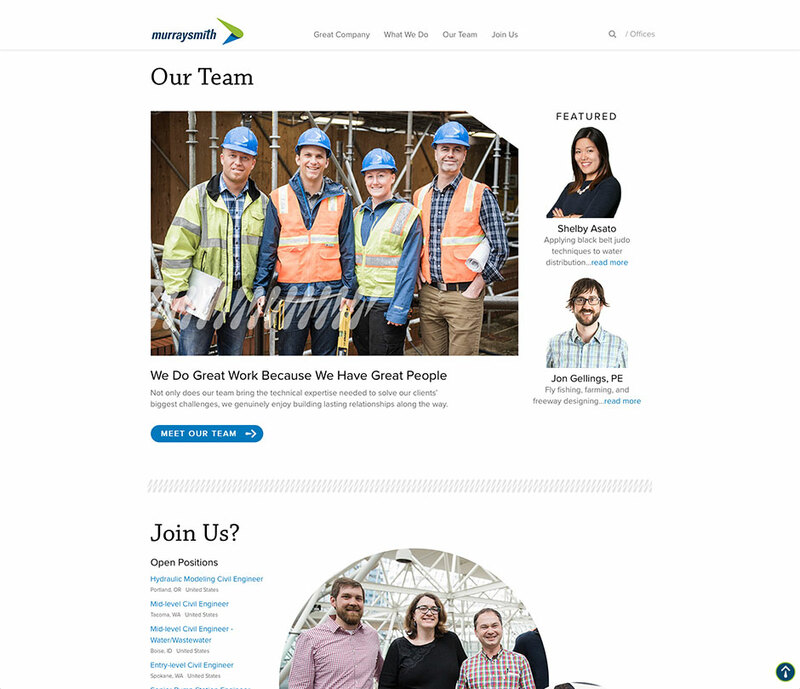 The primary goal of the new site was to attract talent by showcasing what it’s like to work at Murraysmith. To ensure the site effectively communicated with prospective employees, we developed two fictitious user personas. Unhappy with slow advancement at a global firm, he knows he could become a senior leader quickly at Murraysmith. He wants to get to know the firm leaders he would be working with and see some hero projects. About to graduate from Oregon State, she finds a blog post on the Murraysmith site titled “How to Interview at Engineering Firms.” She wants to know if there are openings in her hometown of Boise, ID. 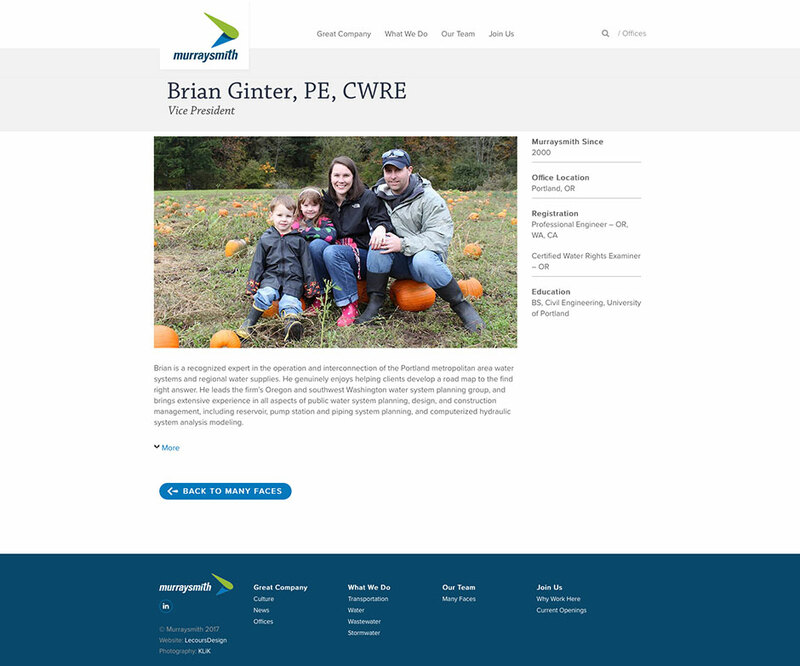 Through graphic design, color and typography, the new site reflects the firm’s new core values, unique attributes and brand personality. Fresh, custom photography by Klik, demonstrates that MurraySmith is a fun place to work. The site’s responsive design provides an optimum user experience on desktop monitors, tablets and mobile devices. The main navigation at the top of each page is simple, with only four buttons and a powerful search feature. As users scroll down a page, the main navigation “sticks” to the top of the page to minimize scrolling. The footer of every page includes a sitemap to help users find exactly what they’re looking for and discover something new. A custom, fun-to-use content management system allows staff to quickly update the site on an ongoing basis. The previous URL, www.msa-ep.com, automatically redirects to the new site. 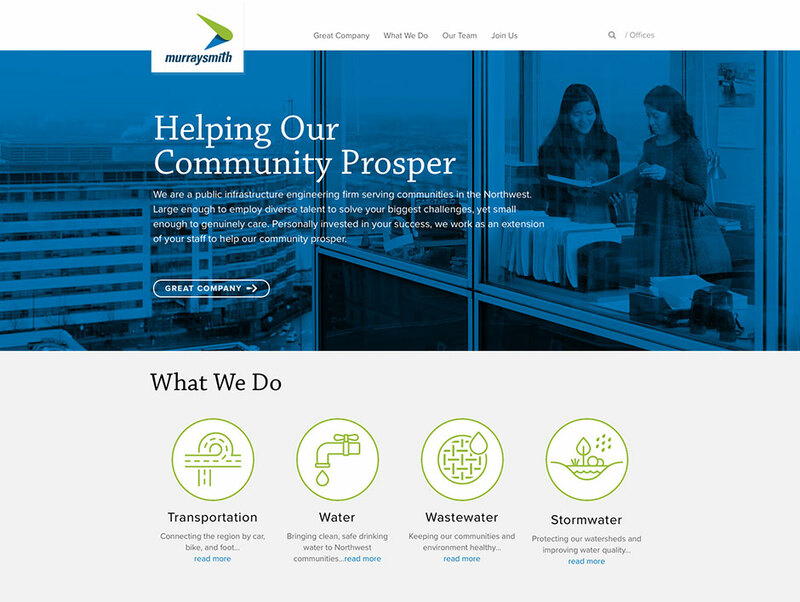 LecoursDesign/Murraysmith earned the “best website” award at the 2018 SMPS Marketing Communications Awards.